William Smith, Joseph's brother, was the editor of The Prophet, a Mormon newspaper based in New York City. William republished Letter VII in the June 29, 1844, edition. This was two days after Joseph and Hyrum were martyred at the Carthage jail in Illinois. 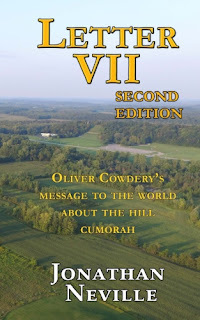 The timing is purely coincidental, but it is an interesting historical fact that people in New York were reading Letter VII which explains that the Hill Cumorah is in New York right about the time that Joseph was sealing his testimony with his blood in Carthage. News traveled slowly in those days. On June 29, 1844, L.O. Littlefield wrote a letter from Nauvoo describing what had happened in Carthage. He sent it to the Editor of The Prophet, but it wasn't published until the July 27, 1844, issue. The June 29th issue also announced that William Smith was the editor of The Prophet. "As the important particulars, and incidents, connected with the coming forth of the Book of Mormon, have ever been, and are now, subjects of enquiry, we shall insert, for the benefit of those who are not acquainted with the coming forth of the above named work, one of the following letters, each week until we are published." Each subsequent issue published another of his letters. My point here is that although Oliver's letters had been published four times already (1835 - Kirtland, 1841 - Nauvoo, 1841 - Philadelphia, and 1844 - England), the editor of The Prophet thought they were so important that he republished them yet again, this time in New York. The June 29th issue happened to be issue no. 7, which is why it contained Letter VII. A fascinating coincidence, isn't it? Some readers may not be familiar with The Prophet. Here is an explanation from the DVD that accompanies Susan Easton Black's excellent book titled The Best of the Prophet. Editors of The Prophet printed an unrelenting defense of Mormonism to counteract exaggerated reports and slanderous claims stemming from Hancock County, Illinois, and printed in eastern newspapers. Editors George T. Leach, William Smith, Samuel Brannan, and Parley P. Pratt confronted politicians, newspaper columnists, and even the governor of Illinois on statements that misrepresented Mormon faith and vilified discipleship. In contrast, they wrote in glowing terms of Joseph Smith and the thousands of Mormons gathered on the banks of the Mississippi in the Zion-like society of Nauvoo. They wrote words of encouragement to fellow believers in the East who were planning to migrate to the Illinois capital of Mormonism. [William] Smith wrote to Leach (the founder of The Prophet) on June 3, 1844, "I mentioned to them [Church leaders in Nauvoo] concerning your publishing a paper in New York, and the Prophet bid it God speed: the council also sanctioned it by a loud and general vote, so 'go ahead' and do the best you can--which I have no doubt you will do--and the rest I will tell you when I get there." With John Taylor and Wilford Woodruff engaged in publishing the Times and Seasons [in Nauvoo], Church leaders believed that a man equal to their apostolic status was needed to fill the editorship of The Prophet. Since William Smith was already serving a mission in the East, having been called on April 19, 1843, the choice seemed obvious. Church leaders met with Smith in May 1844 to ascertain his interest in being named editor of The Prophet. With the approbation of his brother Joseph and fellow members of the Quorum of the Twelve Apostles, Smith agreed to take the helm of The Prophet. 1Two weekly printings of The Prophet were missed—October 26, 1844, and May 17, 1845. 2"Masthead," The Prophet 1, no. 1 (May 18, 1844): p. 1, col. 1. Editors William Smith and Samuel Brannan added a scriptural caveat to the masthead: "Surely the Lord God will do nothing, but he revealeth his secret unto his servants the Prophets” (Amos 3:7). See "Surely the Lord God . . ." The Prophet 1, no. 8 (July 6, 1844): p. 1, col. 1.